Latin Grammy Nominee Mariachi Flor de Toloache is the first and only established all female mariachi band founded in New York in 2008 – come dance to the edgy and fresh take on traditional Mexican music. This is a bilingual concert, all performance announcements and written materials will be in both English and Spanish. 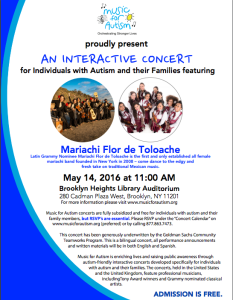 This concert has been generously underwritten by the Goldman Sachs Community Teamworks Program.